Forcing an application to use a specific network card in Windows is something that may end up being super handy at times. For instance, if you’re connected to your company’s corporate [restricted] network via the Ethernet cable and also connected to the Guest [open] network via the wireless network card, you may decide to route an application through of one the two. Note that Windows uses the “metric” of a network card to choose which NIC have priority over the other, and if you want to keep that unchanged, then forcing an application to use a specific network card is what you need. In order to achieve this, we will use a 3rd party application called ForceBindIP, available at this link http://www.r1ch.net/stuff/forcebindip/. The nice thing of ForceBindIP, is that it comes as a portable application (or you can choose the installer version). If you go ahead with the portable version, make sure you keep the files (.dll and .exe) together. As you can see, two files (DLL and EXE) are for 64bit systems/applications and the other two are for 32 bit systems/applications. If you are using a 64bit OS, keep both versions. In fact, you will need to use both, depending on the application you’re going to launch. For instance, Firefox on a 64 bit OS, will still run as a 32 bit application, and for that you will need to use ForceBindIP. Instead, the Microsoft Remote Desktop tool (mstsc.exe), on a 64bit OS, must be ran with ForceBindIP64. I have 2 NICs, one connected to the corporate network that has this IP address: 10.1.1.55. 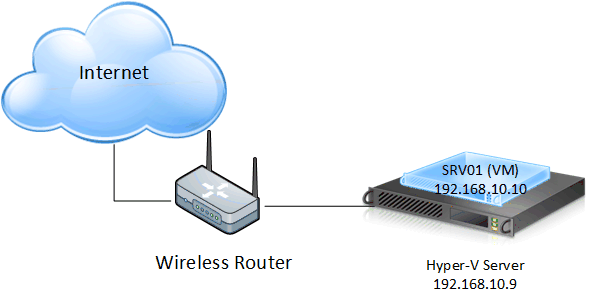 The second NIC, is connected to the guest network and has this IP address: 192.168.50.20. I want firefox to use the guest network. ForceBindIP.exe 192.168.50.20 "c:\Program Files (x86)\Mozilla Firefox\firefox.exe"
That’s it! It’s that simple, really. Firefox will launch and will be using the guest network. 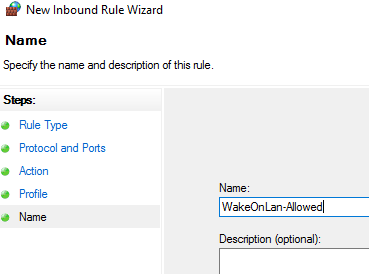 The title Enable Wake on LAN in Windows is a bit generic on purpose as this article is targeting any system. Specifically, the screenshots are take from a DELL Optiplex Micro 3040 system, but applies to any other vendor as well (screenshots will differ). The reason why I’m specifically writing this article is because I struggled a bit more than usual with a Micro 3040 model running Windows 10 and I had the 3020 working with no issues. Again, these steps apply to any system running Windows! 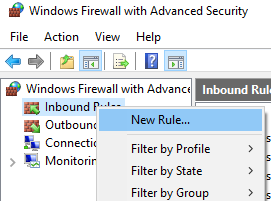 Also note that normally, you do not have to set all of the below up (like Firewall etc). Let’s go in steps, starting with the basics BIOS settings. Go in the BIOS by starting the computer up and by pressing F2. 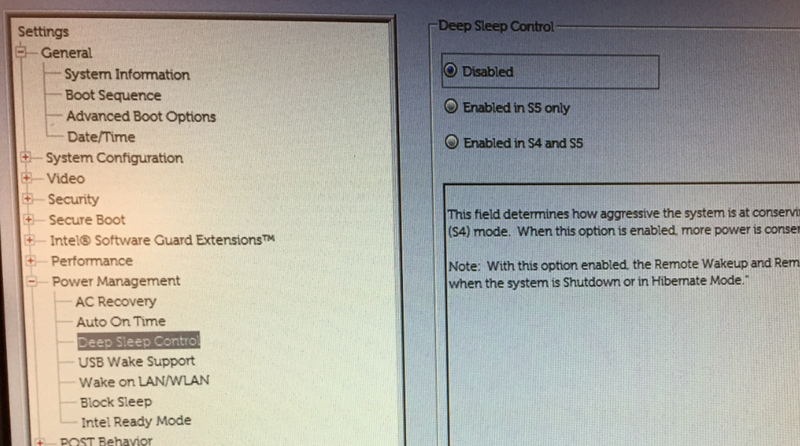 On a DELL system, go to Power Management and Disable Deep Sleep Control. If you’re not configuring a DELL, find the option (if it exists) to prevent the system from fully shutting down or hibernating. 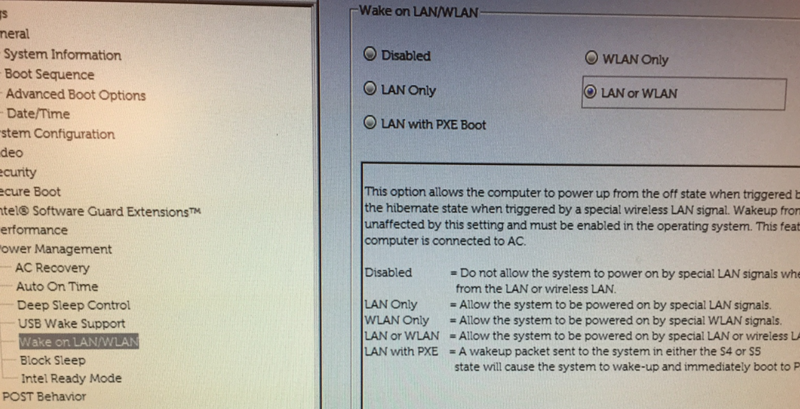 Enable Wake on Lan (or Wan or both). In order to fully Enable Wake on Lan in Windows, there are a few settings to be changed at the OS level. This process covers Windows 10’s settings, if you’re on Windows 7 or earlier, you may need to skip a setting or two as not present in these versions of Windows. 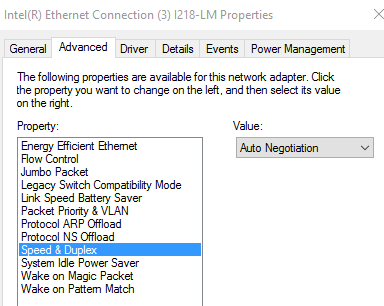 Upgrade the network interface card (NIC) drivers to the latest available. Make sure Speed&Duplex is set to Auto Negotiation. 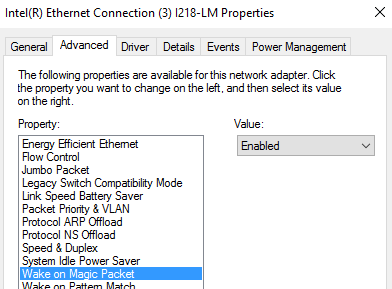 Enable Wake on Magic Packet. Go to the NIC’s Power Management tab and select Allow this device to wake the computer. In Windows 10, go to the Power Options under Control Panel. On the left hand of the window, click Choose what the power buttons do. 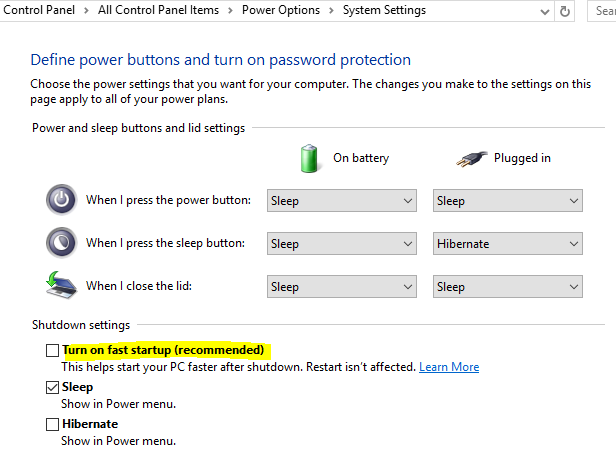 Disable the option Turn on fast startup (recommended). Note that this option might get reset after running Windows Update. I have not encountered this problem myself yet. 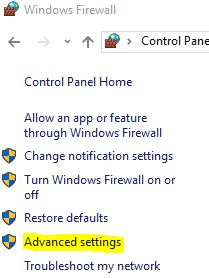 Go to Control Panel > Windows Firewall > Advanced Settings. 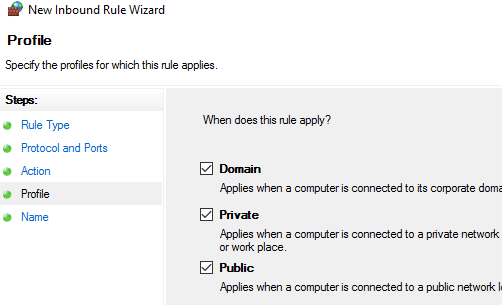 Right click on Inbound Rules and select New Rule. 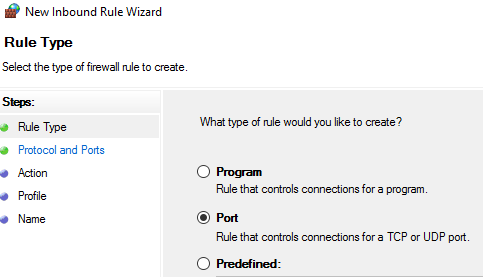 In the New Rule Wizard, select Port and click Next. 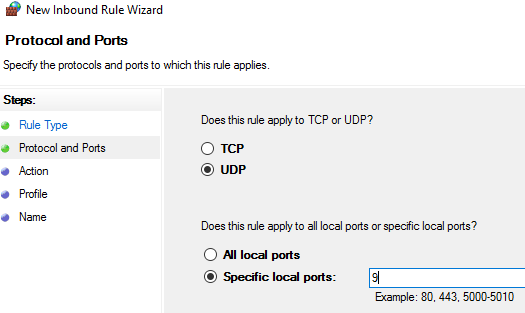 Under Protocol and Ports, select UDP and Specific local ports and type 9. This should be enough for you to get Wake On Lan configured on the machine you want. This article will describe how to set up an L2TP VPN Server on Windows Server 2012 R2 start to finish and step by step including Firewall configuration and port forwarding. The way I’m going to set it up includes the NAT service as well that will allow you to not only connect to the L2TP VPN but also to access the internal LAN you’re connecting to. One of the reasons why I tried this was due security (I never did it before). 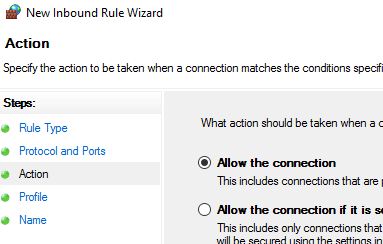 I didn’t want to use Windows 10’s “Incoming connection” as that will set up an insecure VPN server using the PPTP protocol. If you’ve already set up the VPN bit and are having issues with reaching anything within the LAN you’re connected to (even the VPN server itself), then you might have missed the NAT service. This article might look lengthy but trust me, the actual configuration is pretty fast, I’m just adding literally every single step. The step by step guide was performed on a clean Windows Server 2012 R2 Virtual Machine running in Hyper-V (Windows 10 Pro is the Hypervisor sharing its only network card). The steps apply also when you’re performing this on a physical Server. The above represent more or less what the network behind the router looks like. In my specific case I have other plain switches between the wireless router and the Hypervisor (which, again, it’s not a Server but a Windows 10 desktop). By default, Windows Vista and the Windows Server 2008 operating system do not support Internet Protocol security (IPsec) network address translation (NAT) Traversal (NAT-T) security associations to servers that are located behind a NAT device. Therefore, if the virtual private network (VPN) server is behind a NAT device, a Windows Vista-based VPN client computer or a Windows Server 2008-based VPN client computer cannot make a Layer Two Tunneling Protocol (L2TP)/IPsec connection to the VPN server. This actually applies to every Microsoft OS up to Windows 10’s latest release (I’m writing this on the 22nd of September 2016). In order to resolve this, you will have to add/modify the following key in the registry and reboot afterwards. For the less experts, keep reading to see the below detailed steps in order to create/modify the Key. For Windows XP, the Registru subkey location is HKEY_LOCAL_MACHINE\SYSTEM\CurrentControlSet\Services\IPSec. Add the Key above, but give it value 1. Modify the Key’s value to 2. 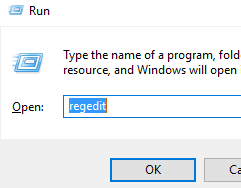 Open RUN by pressing the Windows key + R, type regedit and press Ok. Alternatively, if you’re on Windows Vista and above, click Start and type regedit and press Enter once the Registry Editor’s icon appear. Navigate all the way to HKEY_LOCAL_MACHINE\SYSTEM\CurrentControlSet\Services\PolicyAgent (or HKEY_LOCAL_MACHINE\SYSTEM\CurrentControlSet\Services\IPSec for Windows XP). 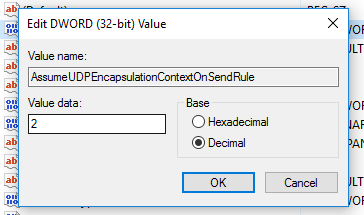 Right click on PolicyAgent (or in an empty spot on the right pane) and click New > DWORD (32-bit) Value. Name it AssumeUDPEncapsulationContextOnSendRule. Note, if you saved it with the default name, you may rename it by right clickcing on it > Rename. If it already exists, go to the next step. Right click on the newly created DWORD and select Modify (or double click on it). Under Value data type 2 and click Ok.
Now you should be able to connect to the VPN.